Every so often, a game that was not even on your radar comes out of the left field, captures your imagination and refuses to let go until it is beaten. 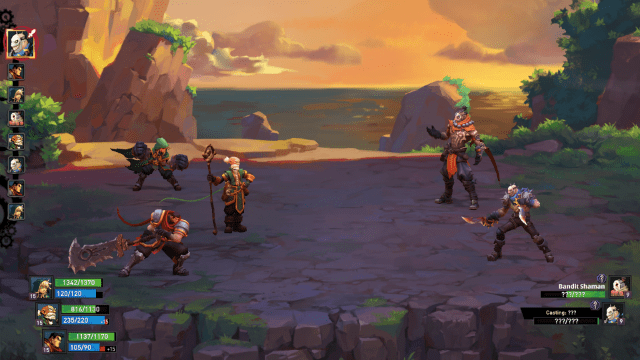 Without wanting to completely void the point of this review, Battle Chasers: Nightwar has become one of these games. Coming from THQ Nordic and Airship Syndicate Entertainment, Battle Chasers is based on the Joe Madureira comic book series that ran over nine issues from April 1998 to September 2001. I wasn’t aware of this source material, I have to be honest, but based on the characters and story in this game, I’ll certainly be looking out for them. You can take control of three of these heroes at any one time, and they can be changed at the Tavern or at the entrance to dungeons, so making sure you have the right mix of abilities can make the difference between success and failure. As the group approaches the Lost Isles, their airship is ambushed by bandits who force them to crash land, and we are put in control of Gully, as she begins her search for her friends, and those who attacked them. As the game opens, Gully is alone, and must explore. This acts as a kind of tutorial for the rest of the game, despite not being signposted as such. If you have ever played any of the classic JRPGs, then you’ll be right at home here. It put me in mind most of Final Fantasy 7, with your character exploring a series of static screens full of enemies and treasures to be found, and when the particular dungeon or exploration zone you are in is complete, there is a world map that allows you to move to the next section. The enemies are always visible, both in the world map and in the zones, so a modicum of planning and cunning will really go a long way. As the level of the dungeons rises, aggravating too many enemies at once is a recipe for disaster, mainly because they can often hit faster and harder than you can heal. Luckily, as the characters explore, they have abilities that can be used to turn the tide when the fighting starts. Gully has a hammer punch that can stun enemies, which carries into the actual fight, and Garrison has a similar ability where he can hit them with a stun grenade. Calibretto, on the other hand, has the ability to shoot enemies from a distance, which not only damages them but can lead them away from their friends and makes divide and conquer a bit easier. Calibretto also has an incredibly helpful heal ability that can be used up to five times when not in combat to heal the team, saving your potion stock. Combat in Nightwar is classic turn based battling, with an active timer bar that can move the protagonists up or down the order, based on how long the action that is chosen will take to cast or perform. In what amounts almost to a love letter to those same JRPGs, you have the option of a physical attack, which is instant but not very damaging, an ability, which consumes some of your Mana but will give much stronger results, or if you have reached a certain level in the game, a burst attack which is available when a burst gauge is full. Think of it like the Limit Breaks in Final Fantasy 7 and you won’t go far wrong. In addition, a turn can be spent using a consumable item such as a potion, while there is a final option allowing you to flee the battle. Be warned though, if you flee in a dungeon, the enemy you are trying to get away from is still all up in your grille, so a clean pair of heels will be required for safe extraction from the situation! Fleeing can also fail, which gives the enemy carte blanche to brutalise you and finish you off. If the entire team is knocked out (no-one ever really dies in this game it appears) you awaken in the tavern in the town, but you drop a proportion of the gold you were carrying as a penalty. In a nice touch, when you make your way back to the dungeon you popped your clogs in, the option to continue is given to you, and you can pick up where you left off, with all defeated enemies still dead and any blink stations you have activated available. Blink stations allow you to fast travel, both around the world map and within dungeons, which can be a real time saver. The only exception to the all dying rule is if you are beaten by a boss (and you will be, believe me). In this case, the whole team respawns at the crystal just outside the boss’s room, which again can be a godsend. There is one change that was introduced into the fighting mechanic in this game, and that is the concept of Overcharge. Now, in the normal run of things, the amount of Mana you have is finite, and when it runs out, you can’t use your most powerful attacks unless you use a Mana potion. 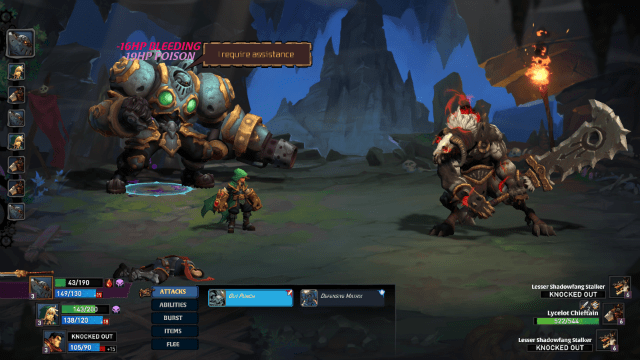 In Battle Chasers, when the characters use a normal attack, they earn Overcharge, which acts like Mana and allows abilities to be used. These will first burn through any Overcharge you have accumulated before using Mana for the remainder of the cost. So if you are short of Mana, rather than spending a turn not hitting the bad guys, you can use a physical attack, do damage and earn Overcharge, which will then make a stronger attack available. Overcharge that isn’t used is lost at the end of each encounter, so if you’ve got it, you may as well use it! Resting in the Tavern will restore all the heroes health and Mana, but acts in a way like the Dark Souls series bonfires, resetting the over world and repopulating with enemies. The dungeons, once completed, can be explored again at higher difficulty levels. Obviously, the higher the difficulty, the higher the risk, and the bigger the potential rewards. However, the game is honest with its appraisal of your chances of successfully completing a dungeon, and I saw “Impossible” emblazoned on my screen more than once. In addition to the story, and the mandatory dungeons that have to be completed, a bit of exploration on the world map will reveal other dungeons and “Exploration Zones” to be found, which can again house some good gear, so are certainly worth exploring. These sectors are a good way of levelling up your characters, as in a somewhat unusual move, if you attack enemies on the World Map who are of a lower level than you, you do not earn XP, and so the usual JRPG grind is made a little harder. It’s like the game wants you to push yourself by taking on challenging enemies, and rewards you for doing so. This does make things a bit harder, as if you are under levelled for the area you are in, it only takes one attack from a boss to cause a catastrophic collapse of your team and a trip back to the Tavern. I can see why they have done it, but it does go against the usual run of things in these type of games. As you level up, the characters learn not only new abilities and attacks (and get stronger, naturally), you also unlock Perk Points, which can be spent to make them stronger in one of two possible perk trees. As you add points, the amount of attack power they have, the speed at which they attack, and even the abilities that each character has can be improved. As an example, Gully has an ability called Scattershot, where she will pull a big stone out of the ground and throw it at an enemy, with the shrapnel from the attack hitting a second enemy. With Perk Points spent on Scattershot 2, the second enemy will be be hit for more damage, and so it goes for the rest of the characters. 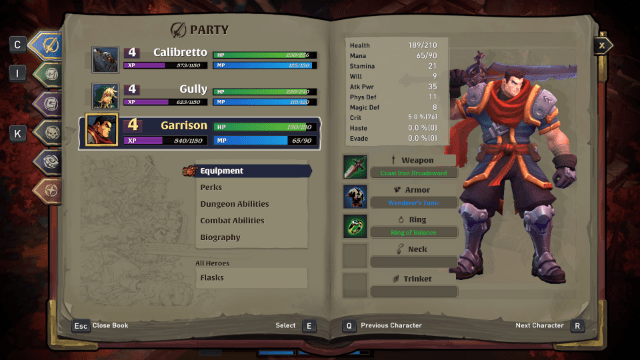 There is also a deep and involving crafting system built into Battle Chasers, and as you fight and defeat enemies, they will drop various crafting components. In an interesting move, the crafting can only be done at a crafting table, and these are found either in the town by talking to various NPCs, or in dungeons. Being able to craft new gear and equip it halfway through a dungeon, with the stat boosts that are possible to be gained, can make the difference between success and failure. The interface is very flexible, and allows you to try and craft an item even if you don’t have all the required ingredients, but for a reduced chance of success. If you need five items, for instance, but only have four, the chance of crafting the item will be 80%, but it may be worth the chance in case you can pull it off. If you fail, the rest of the ingredients you put up will be destroyed, so there is a great risk/reward mechanic in play. On the flip side of the coin, if you put more than the required amount of items in, the quality of the item rises, and you can end up with some very good gear indeed, seeing stuff right up to epic quality delivered. 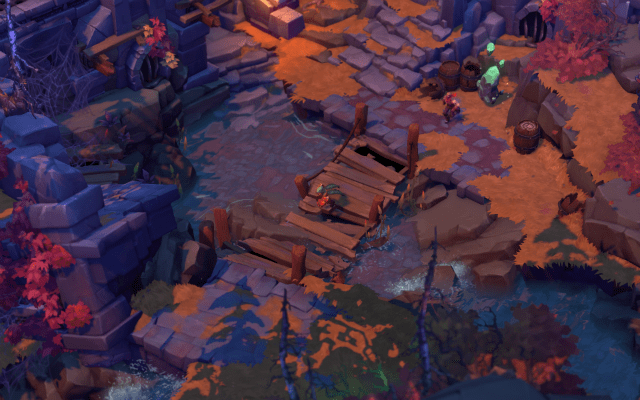 Graphically, and Battle Chasers: Nightwar is beautiful. There is a clear design direction at play, which I assume comes from the game’s comic book roots. Animation is smooth, the hand drawn backdrops look great, and the cut scenes are well scripted and acted by the cast of the game. For such a simple concept, the production values really are top notch, and I am loving exploring different areas just to see what they look like. Even the loading screens are works of art, showcasing areas and enemies whilst generally looking amazing. The sound design also needs praise, as the crunching combat sound effects are counterpointed nicely by the understated music, which serves to heighten the tension as you are creeping around a cave full of werewolves. There is absolutely nothing to complain about with the presentation of this game. 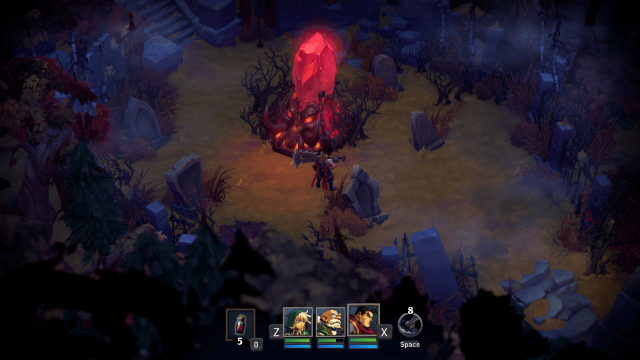 In short then, Battle Chasers: Nightwar is a throwback to classic JRPGs, but in many ways an improvement. It’s like Aliens compared to Alien; all the aspects that made the original great have been polished up, tweaked and turned up to 11 to deliver something that is arguably even better than the inspiration. In my time with the game, I haven’t found anything to dislike. If I’ve died, it’s because I’ve been unprepared or too cocky, going for an attack when I know I should have used the time to defend, for instance. If you have even the slightest interest in turn based RPGs, you need this game. It really is that simple!